Mark your calendars, book a babysitter, and call your friends to make plans for three great nights in Newburyport! Enjoy merchant hospitality, live entertainment, shopping, and dining in beautiful and festive downtown Newburyport, The Tannery, Merrimac Place, and Horton's Yard. Spend your evening strolling from shop to shop as you stock up on holiday gifts while enjoying munchies and beverages offered by local merchants. 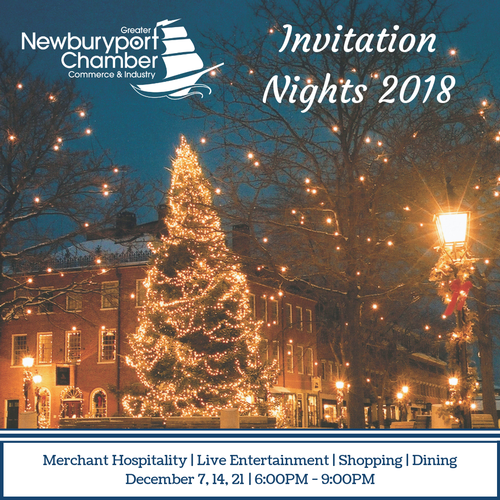 These Newburyport Invitation Nights will get you in the holiday spirit and will turn any Scrooge into Kris Kringle.